Table of Contents G E T R E A D Y T O FA C E T H E D AY: Foundation, blush, and more! A C O M M I T M E N T T O N AT U R A L LY D E R I V E D P R O D U C T S , F O R M U L AT E D W I T H O U T T O X I N S .
CONFIDENCE WITHOUT COMPROMISE When you choose our mineral-based, noncomedogenic, essential oil-infused makeup, you can feel good about what you put on your skin. 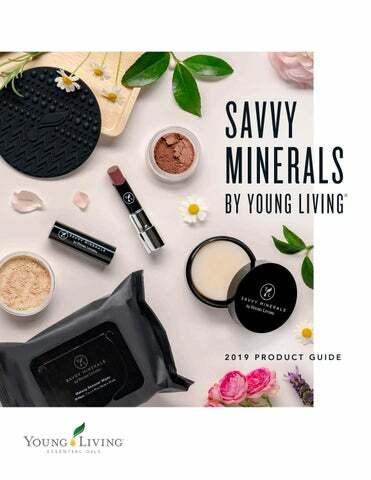 Savvy Minerals by Young Living ® is always formulated without talc, bismuth, parabens, phthalates, petrochemicals, nanoparticles, synthetic fragrances or colorants, or cheap synthetic fillers. Control YOUR coverage Savvy Minerals by Young Living Misting Spray gives you thorough, even, and smooth application of our mineral-based makeup. Infused with pure essential oils—including Lavender, Cedarwood, Rose, and Geranium—and formulated without parabens and phthalates, it gives your skin a vibrant glow and keeps your look in place all day long. PRIMED AND READY Prep your face for a look that will last all day with Savvy Minerals by Young Living ® Primer. Infused with pure essential oils, these skinsmoothers create the ideal surface for foundation application, so you can rock your flawless face morning to night. With two different noncomedogenic formulas, you’ll find the primer that matches your needs. Dry skin, dive in! Keep your complexion hydrated with this skin-loving formula that includes Geranium, Bergamot, Cedarwood, and Rose essential oils and nonnano ingredients. Keep shine and oil at bay! Skin will look blemish-free, thanks to Tea Tree and Manuka essential oils. Cool No. 1 (Item No. 20776) Build luminous coverage with our noncomedogenic mineral foundation formulated for sensitive skin and a wide range of skin tones. The ultrafine mineral powder minimizes the look of imperfections, blemishes, and pores for a gorgeous, airbrushed look for everything from sheer, casual looks to full coverage. Neutralize any imperfections and even your skin tone with no-fuss application! Make sure to prep your skin with ART 速 Renewal Serum, followed by ART 速 Light Moisturizer; then sprinkle a bit of foundation into the jar lid. Spray your foundation brush 2-3 times with Savvy Minerals 速 Misting Spray and gently tap off any excess moisture. Swirl your brush to collect the powder and tap lightly to dust off any excess. Apply directly to skin, using circular motions to blend; repeat as necessary to build coverage. Make sure to extend coverage all the way out to the ears and to the underside of the jaw for a thorough finish. Getting the coverage you want works only if your foundation shade is right for your skin tone. With a few simple tips, foundation color matching is simple! Find your undertone Find the category where the traits match yours to find your undertone. Find your shade Each tone of Savvy Minerals by Young Living Foundation comes in various shades—No. 1 is the lightest in each range, and they get progressively darker. Using your undertone, select the shade closest to your skin. Make sure that you’ve found the right shade by generously applying your foundation to your lower cheek along your jawline to see that it blends perfectly. *Savvy Minerals by Young Living ® Foundation shades in Dark No. 1-4 are neutral tones; you can create a neutral shade as unique as you are by combining shades! When light catches your sun-kissed cheeks or the luminescent finish to your look, all eyes will be on you. Creating the perfect contour is simple with the perfect shades and the right tools! Start by creating an even base with Savvy Minerals by Young Living ® Foundation. 1. Using your contour brush, apply a foundation a few shades darker than you normally wear or a bronzer shade such as Summer Loved; draw a line along the cheekbone, from the upper ear to the middle of the cheek, to create a shadow. 2. Next, shape your features by following your jawline with the same product; then trace down each side of the nose and across the top of the forehead to add dimension. 3. To get an extra glow, take your foundation brush and spray it lightly with Savvy Minerals by Young Living ® Misting Spray. Use the brush to gently apply bronzer in the Crowned All Over shade to your upper cheekbones. 4. Highlight your face by applying Savvy Minerals by Young Living ® Veil to the upper cheekbones, forehead, and bridge of the nose. 5. Using a clean brush—your foundation or kabuki brush works great—blend your bronzer, highlighter, and contour to eliminate any harsh lines. Bring your complexion to life by applying Savvy Minerals by Young Living ® Blush to the apples of your cheeks. Take your blush brush and apply your favorite shade to the fullest part of your cheek; then sweep upward toward the temples, blending well. From a light, youthful flush to a bold exclamation of vibrant color, use your blush to let the world know you’re ready to be seen. (Item No. 23954) Create eye-catching styles with help from our first-ever pressed-powder eyeshadow palette! Each gorgeous shade is made with a Lavender-infused formula that includes coconut oil and shea butter for a velvety smooth application that easily blends and builds. Free of nanoparticles, fillers, parabens, or synthetic fragrances, these stunning shadows meet your high standards with flying colors. EYESHADOW Define your eyes with a range of matte and shimmering eyeshadow shades. Our concentrated, mineral-based shadows glide on smoothly for velvety, longlasting wear. Our irritantfree formula— formulated without parabens, phthalates, talc, nanoparticles, or synthetic fragrances—makes them suitable for even the most sensitive eyes. EYELINER Savvy Minerals by Young Living® Eyeliner Amp up your look by giving your eyes extra definition with the Jetsetter shade (Item No. 20791). The high-impact payoff of our mineral eyeliner was made to take you from morning errands to evening outings without a smudge! (Item No. 21072) Savvy Minerals by Young Living ® Mascara glides on smoothly and perfectly complements and accentuates your natural beauty. Infused with Lavender essential oil, the ingredients work to condition and nourish your lashes and give you a defined look. •	Apply a small amount to your lips and massage in small, circular motions to exfoliate. Soften up before you pucker up! With just-right exfoliation, your lips will be primed for your favorite gloss or lipstick. •	Use a water-moistened cotton pad to remove the scrub. •	Follow with your favorite lipstick or lip gloss. •	Use several times per week or as needed. LIP GLOSS Our Peppermint essential oilinfused lip gloss plumps up your pout and gives lips a fuller look. Moisturize and soften your lips without the sticky feel and—more importantly— without worrisome ingredients. Make a statement without saying a word. Give your lips a kiss of color in five sweet shades and a formula without parabens and phthalates that delivers deep hydration in a simple swipe. Hydrate and tint your lips in a range of stunning shades, all infused with Tangerine essential oil. Boost your spirits and your confidence with one of our favorite scents and these vivid, fresh colors! Savvy Minerals by Young Living® Cinnamint-Infused Lipstick puts your perfect pout on display. Make lips appear fuller with the velvety formula in this essential oil-infused lipstick. Put a finishing touch on your favorite look, wow the crowd, or rock a bold lip for its own sake! tools for the job These luxurious brushes are crafted from the highest-quality materials and are soft on skin and easy to clean. Concealer Brush (Item No. 20844): Cover the tiniest of flaws! This brush is especially great for the undereye area. Contour Brush (Item No. 20843): Sculpt your cheekbones, nose, and jaw. Bronzer Brush (Item No. 20839): Bring a natural glow to your face and definition to your cheeks, nose, and chin. Eyeliner Brush (Item No. 20846): Tackle every look with this dual-ended brush. Create an ultra-fine, precise look with the pointed side or a thicker line with the angled side. Great for brows, too! Eyebrow Brush (Item No. 20845): Finish your polished look by separating your lashes and sculpting your brows. Kabuki Brush (Item No. 24283): Blend, blend, blend for a flawless, finished look. It’s easy to keep your brushes clean using Savvy Minerals Silicon Brush Cleansing Pad. This brush pad is multitextured to boost cleansing power, so your favorite brushes are always ready for you to use. Clean brushes make for fresh-looking skin. Keep things clean using Savvy Minerals Solid Makeup Brush Cleaner, which uses all natural ingredients and essential oils including lavender, lemon and orange to get the job done. Easy-to-use makeup remover cleansing cloths effectively and gently remove makeup—even mascara— without irritation and without a drop of water. Skin is left feeling clean, soft, and refreshed. And with no heavy residue left on your skin, there’s no need to rinse after use. Formulated to be ideal for all skin types. Keep your favorite Savvy Minerals by Young Living ® products stashed in new, stylish gear from our Young Living Gear store! are genuine, free from harmful synthetics, and of unmatched purity. 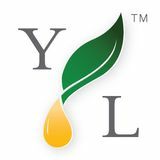 Our proprietary Seed to Seal quality commitment is our pledge to you, the earth, and ourselves that Young Living products will be the best available, now and always. Seed to Seal and its three pillars—Sourcing, Science, and Standards— are infused into every aspect of our exacting essential oil production processes, both on our own farms and our carefully curated family of partner farms. Seed to Seal is infused into our painstaking quality testing and retesting to ensure that your family enjoys the purest essential oil products on the planet. Ultimately, Seed to Seal is the basis for everything we do. We know that for us—and for you—simply nothing else will do. We source from our corporate-owned farms, as well as carefully curated partner farms and Seed to Seal-certified suppliers that adhere to our Partnership Principles. This empowers us to source conscientiously with priority on quality, sensitivity to community impact, and mindfulness toward ecosystems. This empowers you to feel confident that Young Living products will be the best available—now and always. SCIENCE While our product quality starts in the fields, it’s proven in the lab. Seed to Seal is behind our meticulous quality testing and retesting, performed by more than 50 highly trained scientists in our D. Gary Young Research Institute. We also spot test product samples as needed with independent, respected, and accredited labs to validate our testing. We create our pure, effective formulas to offer products that contain the cleanest and most innovative ingredients available, ensuring that your family enjoys products that are genuine, free from harmful synthetics, and as pure as nature intended. As the leader of the modern essential oils movement and a close partner with the earth, it’s part of our global stewardship and accountability to do business responsibly—from sustainably sourcing rare botanicals, to uplifting local communities, to going above and beyond to comply with local environmental rules. We choose to partner with sources we know produce pure essential oils and ingredients ethically and legally, setting a gold standard for sustainability that you can trust. For more detailed information on our Seed to Seal pillars, visit SeedtoSeal.com. PREMIUM STARTER KIT You love the way you feel when you wear Savvy Minerals by Young Living. With our new Premium Starter Kit, you can share the secret to a radiant look that enhances your natural beauty! Your makeup doesn’t define you, but it is one of the ways you express yourself—that’s why you choose products that pay off in quality and benefits. Our Savvy Minerals by Young Living formulas are made to create high-performing looks as flawless as you are—made only with ingredients you can feel good about. It's not a slogan–it's our calling.